Survival and mating success are key fitness components of mammalian males. Because energy is limited, life history theory predicts trade-offs between current and future reproduction. While many studies have examined fitness trade-off in females, we know little about trade-offs faced by males. In polygynous species, male mating success is largely dependent upon intrasexual competition. Consequently, males have greater uncertainty over the benefits of a given allocation than over its costs, and the correlation between mating effort and success is likely much weaker in males than in females. We analyzed 14 years of data on the mating effort and survival of marked bighorn rams to investigate fitness trade-offs. Dominant rams defended single estrous ewes (“tending”) while subordinates attempted to copulate after separating the tending pair (“coursing”). We estimated the participation in tending and coursing for each ram and the effort in searching for breeding opportunities by each ram each year. 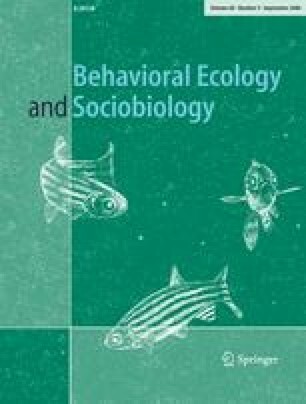 We compared these three behavioral indices of male mating effort to demographic parameters, individual characteristics, and both yearly and long-term survival. Mating effort during the rut was unrelated to ram overwinter survival, but longevity was positively correlated with mating effort between 2 and 5 years of age. Persistent variation among rams is likely to explain this pattern, suggesting that in natural populations a few high quality males enjoy both high mating success and high survival. We gratefully acknowledge the financial support of the Natural Sciences and Engineering Research Council of Canada (scholarships to FP and Discovery grant to MFB), the Challenge Grants in Biodiversity program (Alberta Conservation Association, grant to FP), les Fonds de recherche sur la nature et technologies (Québec, scholarships to FP), the Eppley Foundation for Research and The Charles Engelhard Foundation (grants to JTH), and the Université de Sherbrooke. We thank all students, assistants, and volunteers who contributed to our research over the past 15 years. We are grateful to the Kananaskis Field Stations (University of Calgary) for logistic support. For critical comments on the manuscript, we thank Atle Mysterud, Norman Owen-Smith, Kathreen Ruckstuhl, Jean-Michel Gaillard, Giacomo Tavecchia, Dany Garant, and Tim Coulson. This research project was approved by the Animal Care Committee of the Université de Sherbrooke, an affiliate of the Canadian Council on Animal Care.